American artist George Tsui, temporalily relocated to Beijing in 1996, after 20 years in the New York art scene. 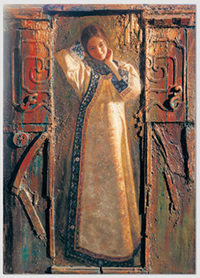 Those travels produced a series of works entitled "Fair Ladies of the Past", featuring Chinese women in the glory and splendor of ancient of China. According to George Tsui, those paintings "employ a dual technique of painting and sculpture that is traditionally ornate yet abstract in the most modern sense." George Tsui's fascination with the beauty and culture of historical China helped inspire him to explore and penetrate the surface of the country's outer landscape and expose the rich inner culture of China. In his time spent in New York George Tsui received a degree in oil painting from the Art Student's League, and while working at NBC George Tsui received the 1977 Emmy Award for Best Individual Craft. Included in his works from that period are paintings chosen for the 1984 Winter Olympics Poster Series. Remember every time you purchase George Tsui artwork over $995, shipping is FREE in the continental U.S. and there is NO SALES TAX when you purchase outside of Colorado. We SHIP WORLDWIDE and offer Layaway for George Tsui art.